Saint Alex is known for chasing away all evil, demons, and wrongdoers. Invoke his presence to protect you from people who would cause harm to you in any way; physically, emotionally, mentally, or spiritually. 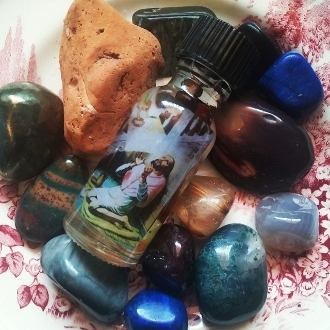 This oil squelches malicious gossip, slander, Hides you from bullies or abusers, and keeps you and your family safe. I have used this oil in several cases to get someone away from their abusive spouse. They are safely relocated before the spouse even realizes what has happened. Completely avoiding what would be a very dangerous situation. It has even been used to draw police to an abuser and send them away for long enough for the spouse to relocate safely before the abuser is released. It also has an incredible ability to cleanse and heal you if you have already been abused. Use with a purple and white candle for best results. Created with allspice, cinnamon, and frankincense oils, herbs, and resins.